Located centrally on the Lebanese coast, 95km both from the borders to Syria and Israel, Beirut is the capital of Lebanon and its largest city. Settled for about 5000 years, it has been ruled by the Phoenicians, Persians, Greeks, Romans, Byzantines, Arabs, Crusaders and Ottomans. Beirut developed a lot towards the end of the 19th century and under the French after World War I. The civil war between 1975 and 1990 destroyed a lot of the historical areas of Beirut. These were subsequently reconstructed but with modern buildings and as a consequence Beirut lacks a large historical core. The historical parts of Beirut which are left today are concentrated around the Solidere area, where a number of mosques, churches and the Roman ruins are located. The Hamra and Verdun areas to the west and southwest are the stylish and elegant parts of Beirut with neoclassical buildings and upper end shops and boutiques. The traffic in Beirut is quite heavy most of the time and especially along the coastal road to Jounieh there are frequent traffic jams. Along the coast there is the Beirut Corniche, a coastal road with a promenade with nice views of the coast and the Mediterranean sea. Beirut has an international airport with direct connections to most cities and capitals in the Middle East and several European cities. 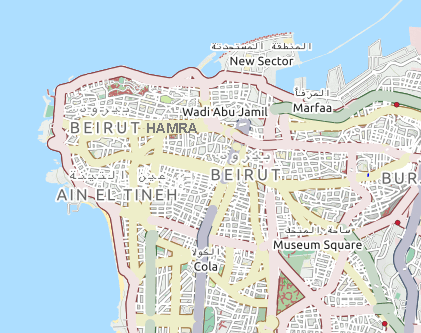 The airport is about 10km south of the centre of Beirut (Hamra). To get to the centre of Beirut you need to take a taxi. There are many hotels in Beirut, but they are relatively expensive. The pricing level is higher than in other cities of the Middle East. Due to the heavy traffic it makes sense to stay in the centre of Beirut (Hamra) if the plan is to visit the city.